Aloha Mamas! 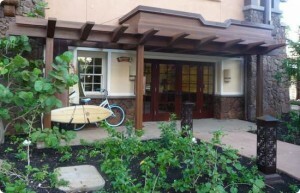 Today I am taking you to the kid’s club at Aulani-Aunty’s Beach House! Most of the activities at Aunty’s Beach House are included for ages 3-12. The kids love this place. Play dress up-I couldn’t even imagine the fun of playing dress up with a Disney owned dress up closet! That’s the every day fun. Then in addition to that, there are complimentary experiences that are included as well on selected days. Some of these are fun for the whole family and others are for the kids only. 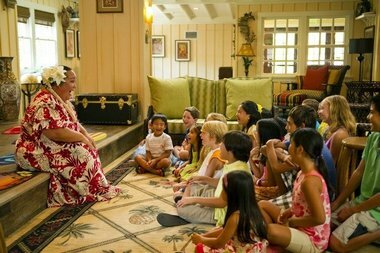 Keiki Hula-lthe kids learn to hula dance! 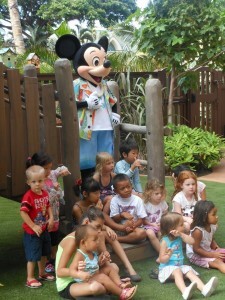 And you never know who is going to drop by to say hello to the keiki! You can also upgrade to a few premium experiences for an additional fee. Fish are Friends-you will get to go up close and personal to see how the animal specialists feed and train gthe animals. It’s a three hour experience that includes lunch, fish food, a DVD of Disneynature Oceans, and a cinch bag. Surf’s Up with Chip and Dale-Chip and Dale come to this three hour experience that includes a themed dinner, cinch bag, and you decorate a mini surfboard. How fun is that? 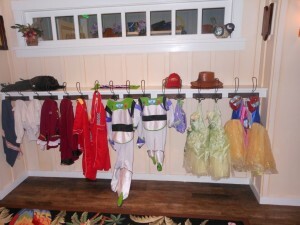 Aunt’s Beach house is a 5200 square foot kids’ club. The children do need to be potty trained to be able to go. Reservations are required for the premium experiences. If you are leaving the children during lunch or dinner you can pay $14 for their meal to be served there. To give you an idea of the premium experiences price, the fee for Fish are Friends is $69. The club is open 365 days a year. The hours do vary by day. They open between 7:30 am and 9am and close between 9pm and 11pm depending upon the day. All children in the age range of 3-12 are accommodated, including any children with disabilities. Safety measures are in place for a secure drop off and pick up and the staff stays in touch via your cell phone. 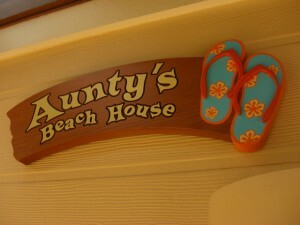 As mentioned Auntie’s Beach House is meant for kids 3-12. 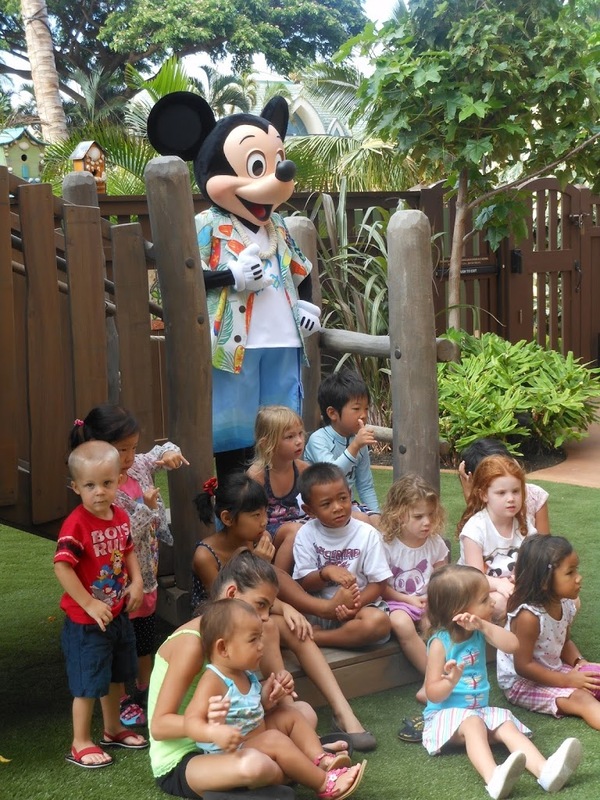 However, if you have a toddler you are welcome to go with them to enjoy the fun as part of the Disney Aloha Junior Program in the early part of the day. 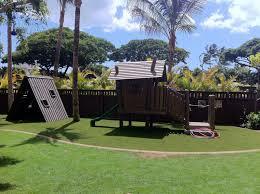 A lot of the family activities are geared to include the toddler age. If the club is crowded, toddlers need to stay in the younger kid’s rooms even with the parents but if it is not crowded you have the run of the house. Very cool! 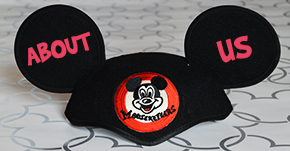 Disney does not offer babysitting for those kids under 3. There are several nanny companies on the island though to choose from if you need a date night away from your younger kids. 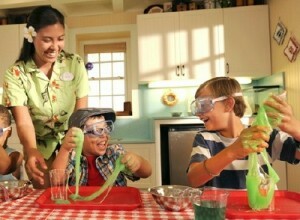 I don’t know about you, but I am ready to take my family to Aulani! 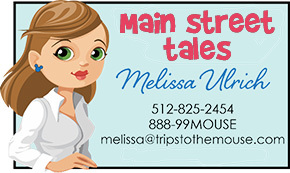 Let’s get to planning your family’s trip there soon!